Discover a few ideas to enhance your home fencing.. If you’re looking to add or update your home’s fencing this summer, there are plenty of things you’ll want to consider. The options for fencing can be daunting; what kind of material will you use, what style, how will it be designed? But as you begin to weigh your options, you may want to keep these three summer fencing tips in mind. While they are best suited to summer, they have their functionality year round. These days your fencing can be as unique and beautiful as your home. There are plenty of options for fencing that is aesthetically pleasing and functional, and one of the biggest influences on this is height. Depending on your needs and desired function you can choose between taller and shorter fences. In summer embracing taller design might prove useful because of the added privacy. When working with a taller fence, you’ll want to pay more attention to your landscaping, mixing taller and climbing plants into your design can make even the most grandiose wall more approachable. While unconventional, adding built-in seating to your fence design can help you get your yard party ready while maximizing your space options. If you have a small, narrow yard, adding built-in benches can help give seating without taking up too much extra space. If you have a more massive yard, you may consider using your fencing to work with your landscape to best create a natural seating area. You may not think of your fence when you think about the lighting for your garden and patio but depending on your fence’s layout adding lighting to the fence directly can be unique and compelling. In smaller yards, fence lighting can solve the question of how to mount or hide lighting fixtures while ensuring you have decent light. By making sure your lighting follows the fence you can be sure no one will be stumbling in the dark at your summer soirees. If you’re ready to add or improve a fence this summer, Hercules Fence is ready to help you get the look and function you desire. Hercules Fence has extensive experience in repairing and constructing fences made out of any and every material. 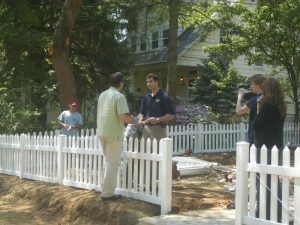 Our experienced team can help meet your fencing needs, whether they’re residential or commercial, for the right price. Give us a call at 757-316-3600 or visit us online. To see examples of our work and keep in touch, don’t forget to follow us on Facebook, Twitter, Google+, LinkedIn, Flickr, and Pinterest. This entry was posted on Monday, May 21st, 2018 at 9:49 am. Both comments and pings are currently closed.